An hour of connectivity, care, and stories, enabled by the networks and nodes we call people. On my last day in Australia I set up my laptop on the wooden table in Kate Bowles (@katemfd) house in Thirroul (near Wollongong, on the east coast south of Sydney). Birds outside sang and cooed, dogs barked, and an incessant lawnmower ran. It was 11:00am. 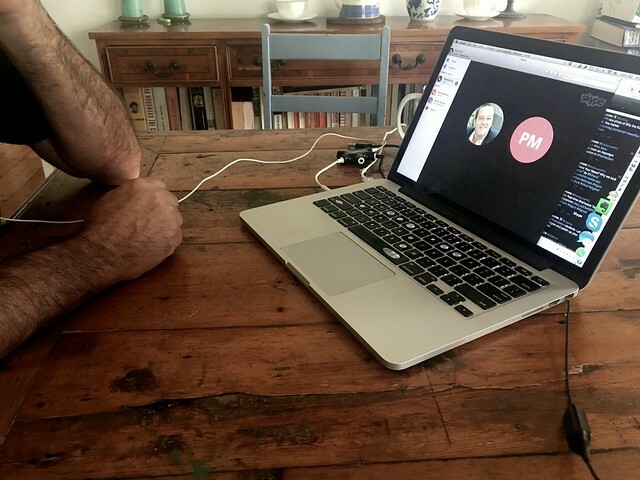 Using an audio splitter to separate output from input, I initiated a Skype call to Antonio Vantaggiato (@avunque) in San Juan, Puerto Rico, where it was 8:00PM the day before and Parisa Mehran (@parisanehran) in Osaka Japan, where it was 9:00am. It’s rather easy to call like this (once you juggle the time zones). The lines of improbable connection include photos and stories of mothers’ chairs, blogs of family stories, a devastating storm named Maria, an idea to send postcards as a symbol of care, a failed visa application forcing remote conference participation, and sharing of a blog post about those postcards. You will hear Antonio share his experiences of trying to contact his Universidad Sagrado del Corazon students and quickly redeploy technology classes taught in covered patios and tents with unstable electricity and wifi. Darn is he ever an optimist. We heard how Parisa got into the networked world, discovered and connected with our project, and some insights to her place of being an Iranian women working as an English teacher in a Japanese University. And always, as she does, Kate brings wisdom and power in her words of care and interest. Here r some of my Ss' responses to the q: How Can I Change ?? One of the answers was u can change ? by #caring. Today I talked abt #PuertoRico & postcards 4 ?? campaign. "I see these things as gifts." @avunque closing a beautiful conversation on the complex world we live in, with @cogdog and @ParisaMehran. I was a bit worried if Antonio’s connection would be stable, but it was, and we talked for a little over an hour. Yes, it’s long, but I have no heart to cut one thing out of it. This is our low/no budget recording approach, with random background noises. 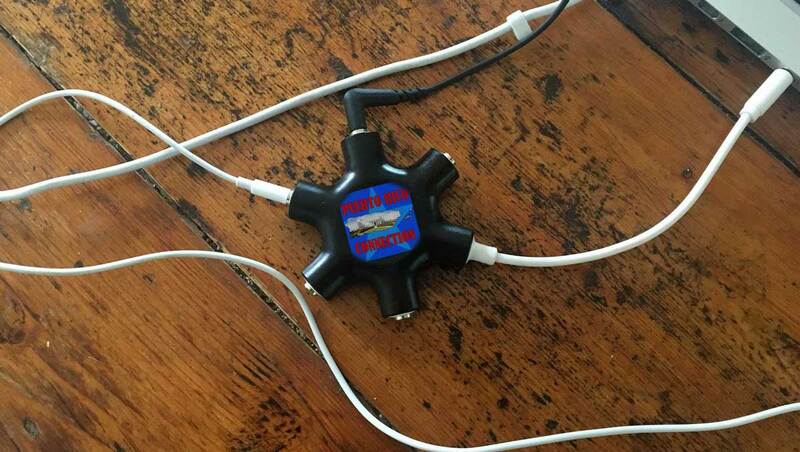 For the tech side, the headphone splitter worked well for Kate and I who shared a laptop, with the sound coming in our headphones, and recording from my laptop mic. I used an add-on that has been a big help for years, the Ecamm Conference Call Recorder. This saves the audio of our conversation as a Quicktime video, but the special thing is that it splits the input audio (Kate and I) with the output (Antonio and Parisa) into separate audio channels. I can use the Ecamm Movie Tools to export the audio as two separate WAV files. And then I run each of those files through The Levelator to even out differences in audio levels. Finally I can import these tracks as mono channels into Audacity. If there is noise in one channel (the lower levels) that distracts from the primary (the bigger peaks), I select the portion and reduce the amplitude. I don’t always completely mute it, as it makes the background too empty, but just to reduce drastically unwanted noise. Small peaks remaining might be someone just saying “yes” in the listening channel, or leaving in the sound of birds in the background. Once cleaned, I add out intro/outtro music, and export as mp3. Then I upload it to TapeWrite where I add in some pull quotes, images, etc at key points in the audio. I probably go overboard here, I could not help myself trying to find related content or links. I really love how TapeWrite Works- on an audio device, you can listen as straight up audio. Just visit our PRConnection channel and look for the subscribe button. But on the web or a mobile device, you get all of the cards that appear at the points in the podcast I have added them- you can use these to navigate to different segments. But wait there is more, each “card” has a permalink, so I can connect you directly to Parisa’s introduction or where Antonio describes how school and the students bring a sense of optimism to the dire situation in Puerto Rico. This, to me is a rather stunningly cool approach to audio storytelling that has tons of potential. And you get 5 hours of show time for free on TapeWrite. And a podcast feed. Beyond all the tech talk, this was such an exciting moment to spend an hour not only marveling over our connections, but most likely, making them that much more strongly connected. As Antonio finishes his semester (on time! even hit by a horrendous hurricane, do you think you could do that?) I hope we can record another session. We already have some audio recorded by his students cued up for the next episode. And look for more updates from Antonio’s blog http://skateofweb.com (encourage him to document more of his experience!). I pledge to keep the connections as connected as possible. And at least send some encouraging tweets to @avunque with the hashtag #care4sagrado. Featured Image: A photo of my Belkin audio splitter used for this podcast, sitting atop Kate’s kitchen table — Headphone Splitter flickr photo by cogdogblog shared into the public domain using Creative Commons Public Domain Dedication (CC0) I took some liberty to remove the Belkin logo and overlay the image I created as the logo for our podcast. Because I can. After GIFfing The Heck out of it, Finally Watched "The Big Country"